One man is an international champion in Standard Ballroom, the other is the national champion in Latin Dance. Chalk and cheese in temperament, suave Shinya Sugiki (traditional ballroom) and fiery Shinya Suzuki (Latin American) have been observing each other’s stellar progress from a distance – until the desire to compete in the challenging 10-Dance Competition (‘a glittering Triathlon’) brings them together. Can Sugiki teach the free spirit Suzuki how to excel in the formal discipline of the waltz – and can Sugiki teach the supremely self-controlled Suzuki how to let his hair down and respond to the earthy, raunchy rhythms of the samba and the rumba? The two champions agree to meet late at night to train together, bringing their dancing partners along: Fusako Yagami and Aki Tajima. But whereas the two women seem to understand each other and make good progress, sparks fly from the start between the two Shinyas. They’re both so different; only their stubborn natures stops them from giving up when it seems that they’re making no progress at all. Sugiki has trained in England since he was five (‘It all started in Blackpool, a country town in England’) whereas Suzuki, who is half-Cuban, was a Cuban citizen until the age of twenty. It looks as if two such different and charismatic temperaments will never be able to learn from each other and the 10 Dance plan is doomed from the start. Or…is it? Inouesatoh’s wonderfully fluid and expressive graphic style is ideally suited to a manga about dancers. She uses a wide variety of panel sizes to convey the dancers in motion, creating some truly breathtaking images. And she’s also very good at capturing the fleeting yet telling changes of facial expressions that tell the reader more than just the words being spoken. Match the distinctive art to a strong story, a mischievous sense of humour and sizzling character interactions and this manga is off to a really strong start. Even though Inouesatoh is good at conveying the magic of ballroom dancing (sparkles and sequins!) she also reveals the blood, sweat and tears that the dancers put themselves through behind the scenes to make it all look so effortless on the dance floor. The characters are brought to vivid life through the dialogue as well as the pictures; as Sugiki and Suzuki constantly clash in the dance studio, their interchanges fairly crackle (helped by the excellent translation by Karhys). As music is vital to any story about dance, Inouesatoh uses song titles as chapter headings (a little freely) ‘Some Day my King Will Come’, ‘Moliendo Cafe is a Samba’ and ‘Estrellita’ and in the Afterword, she explains a little about the inspiration behind these choices. There’s also the usual excellent Translator’s Notes to help shed light on some dance-related terms in the text and the significance of honorifics in certain contexts. 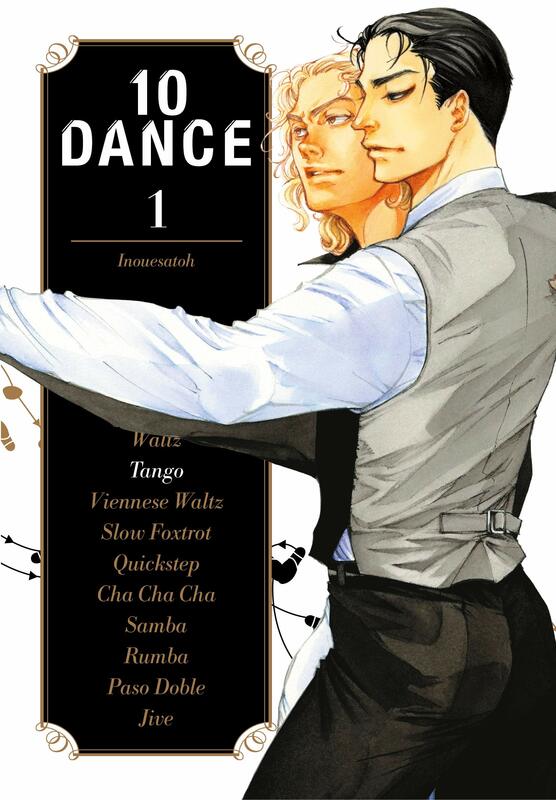 10 Dance is a must-read for anyone who’s enjoyed manga and anime about competitive dance (on or off the ice!) and the lives of the artists who devote themselves to being the very best.